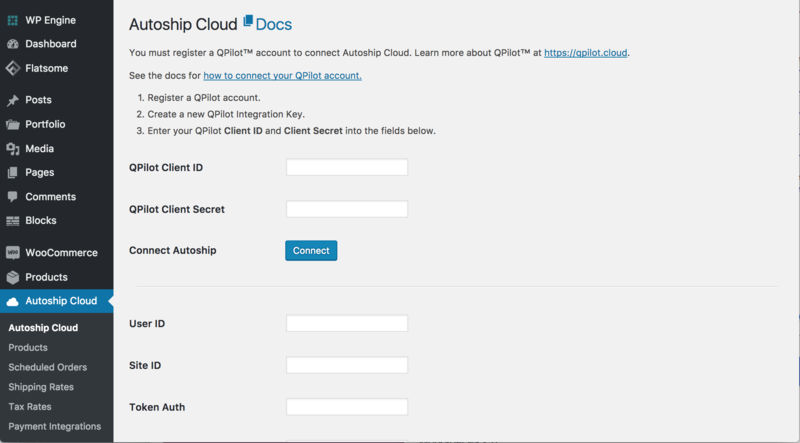 Autoship Cloud is powered by the QPilot.cloud web service. QPilot is the Scheduled Commerce Engine™ that hosts and runs all of the automated processes used to create and manage scheduled orders for your Autoship business. In other words, your Wordpress site and hosting only need to manage what they're best at: the experience of Autoship. All of the "heavy lifting" of scheduling and automating Autoship orders is managed by our engine: QPilot. How does Autoship Cloud work with QPilot? Add templates to your WooCommerce store so you can quickly start converting shoppers and customers into Autoship Customers! When do I create a QPilot account? After installing the Autoship Cloud plugin, you'll find a notice within the Wordpress Admin > Autoship tab prompting you to register a QPilot account and connect your WooCommerce store. This connection integrates your WooCommerce store to the QPilot web service enabling your store to run Autoship in the Cloud!